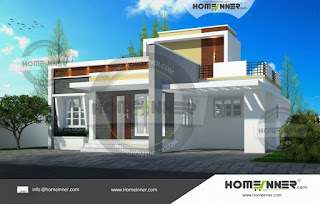 850 sq ft 3 Bedroom Small Home Design is the new simple home design from Homeinner.The stylish affordable home design includes 3 bedrooms,with two bathroom,living area,dining area and kitchen in small area of 850 sq ft.
Homeinner online Home design team showcase a Modern Contemporary 1030 sqft 2 Bhk Small Kerala Home Design front view. Searching for Kerala home design single floor 19.9 Lakh 2 Bedroom 5 Cent land Calicut ? then here is an modern single floor Kerala style Custom build home . If you like this House design idea theme - "850 sq ft 3 Bedroom Small Home Design" , do take few seconds to share with your friends and relatives . Let them know what you like.